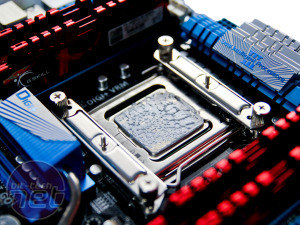 With custom water-cooling still out of reach for many in terms of cold hard cash - after all it's usually more about bling these days than super-cooling - you only have two options if you're an overclocking enthusiast looking to beat the heat in a modern high-end system. All-in-one liquid coolers, such as the Corsair H80 and Antec Kühler, have proven themselves to be as good, if not better, than the very best that air cooling has to offer. They are our first choice when it comes to dealing with toasty CPUs for the simple reason they're incredibly easy to install (so long as you have a 120mm fan slot near your CPU socket), are usually very quiet, and require little if any maintenance. 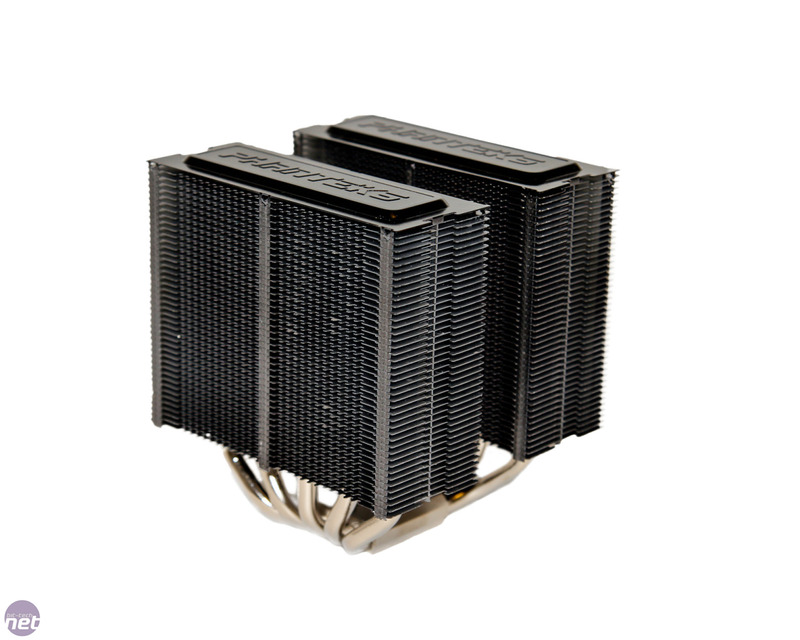 Our second choice is the humble large heatsink. They've been around for years and have got steadily quieter and better at cooling, although many we've seen recently leave a sour taste in your mouth when it comes to installing them. However, they're often not cheap either, with many costing nearly as much as our preferred all-in-one water-cooling systems. Thankfully, they can be incredibly quiet, which means that many still prefer to use them over a Corsair H80, for example, which is slightly louder even at its lowest fan speed setting. 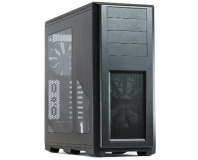 Another area that heatsink and fan manufacturer Phanteks has taken by the scruff of the neck is looks. 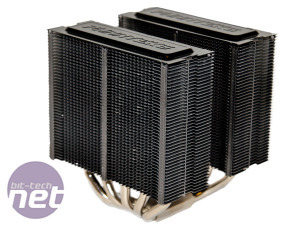 There are plenty of mean or elegant-looking heatsinks out there, but the PH-TC14PE is decidedly racy. 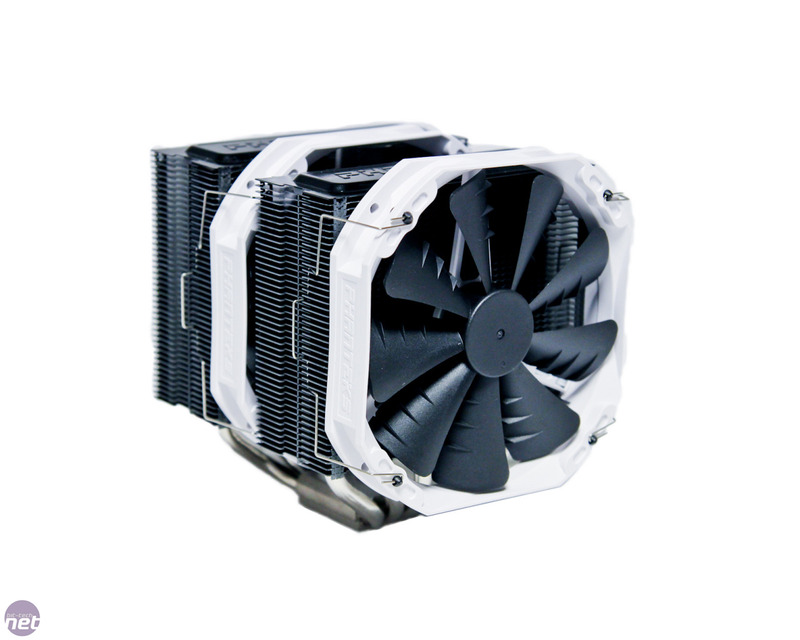 It's also one of the very few coolers we've seen to come in an extensive range of colours, meaning that at last you can match your air cooler to your case's colour scheme instead of the other way round. 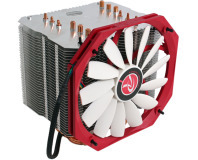 As standard, the PH-TC14PE comes equipped with two 140mm fans, but it's able to take a third. A fan splitter cable is included, so you wire up the two included fans to a single motherboard fan header, while a 7V fan speed reduction cable can trim the noise down if you don't need it on heat annihilation mode all the time. Five 6mm heatpipes do the job of transferring the heat from the sizeable contact plate to the huge stacks of fins. 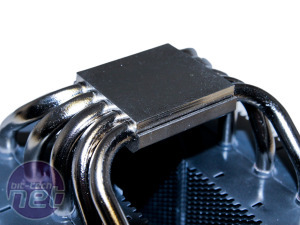 The fans attach using a somewhat bizarre mix of adaptors and clips - it's more time consuming than frustrating or difficult, but you'll almost certainly need to do this after you've installed the heatsink to your motherboard. That means it's going to be far easier to install the cooler with your motherboard out of the case. We have to say that it's a stunning-looking cooler and it's well made too - just as well given it costs over £60. 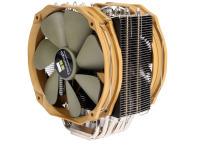 As usual with a cooler costing this much, you're (hopefully) paying for premium cooling at super-low noise levels. Other coolers such as the Arctic Freezer i30 will dish out similar chill factors but won't be nearly as quiet. Installing the heatsink was a fairly straightforward affair, but again, we had to deal with more bits that seemed really necessary to mount a cooler. Out of the box, it's compatible with the three current performance CPU sockets from AMD and Intel - AM3+, LGA1155 and LGA2011, as well as a good smattering of older sockets (check the table below to see if yours is supported). 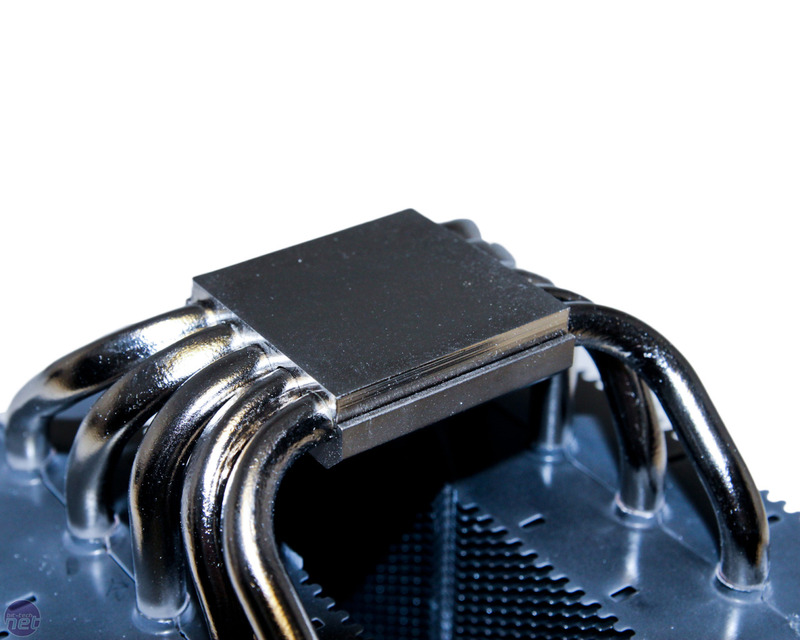 Two mounting plates attach to your motherboard with a large hold-down plate straddling the heatsink and screwing in place into the mounts. You'll need a long screwdriver for the job to reach past the heatsinks, and tall RAM stick owners beware - only standard height DIMMs will fit under this monster unless you raise the outer fan above them, reducing airflow in the process. It's also worth checking that your case's side panel will clear the cooler too - ours didn't, so we had to improvise with some super high-tech brown parcel tape to seal the gap around the side panel as best we could. In short, it's an enormous cooler so measure twice, buy once and hopefully have a curse-free installation. Head over the page to see the results. Budget alternative to the Enthoo Primo. 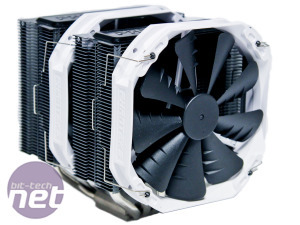 We take a look at Raijintek's flagship cooler, which comes in at just £32.